Tool Tension: Using the easyloop® tool, use recommended gauge (pull needle back 1”, push into loop 1”). Extra Materials: Stiffener: Spray Starch; Pins for pinning snowflake to cardboard while stiffening; Cardboard: for pinning snowflake; Hook: Ornament Hook for hanging snowflake ornament. Stitches used: CHAIN STITCH; SLIP STITCH; SINGLE FAUXCHET® STITCH, FAUXCHET® PICOT STITCH. Special Stitches: Fauxchet® Picot Stitch = Chain 3, Slip Stitch in 3 Chains from easyloop® fauxchet® yarn tool needle tip. Note: * * = repeat the information between the asterisks the number of times indicated after the second asterisk. To begin: With the easyloop® fauxchet® tool threaded with yarn A, create a slip knot (1 inch in size) 6 inches from yarn end. Chain 6 and join with a Slip Stitch to make a ring. Round 2: *Chain 11, Slip Stitch in fifth stitch from easyloop® needle tip, Chain 6, Slip Stitch in back loop of the next Single Fauxchet® stitch on round 1, make a Fauxchet® Picot Stitch, Slip Stitch into the back loop of the next Single Fauxchet® stitch of round 1* six times. Join with a Slip Stitch. Ornaments: Stiffen snowflake. Appliques: Pin to your project and sew to attach. 1. Pin the snowflake to cardboard or hard surface adjusting the points of the snowflake. 2. Spray with spray starch. Let dry and remove pins. 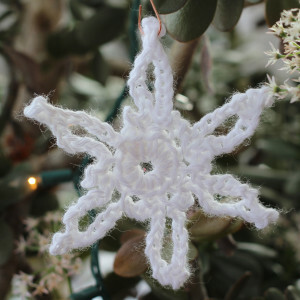 The fauxchét snowflake ornament is made with the easyloop® fauxchét® yarn tool. The basic stitches and techniques can be learned in The Art of Fauxchét® E-Book. A link to download the E-BOOK, our how-to videos, and a written instruction booklet to get you started (with easy scarf patterns) are included with the easyloop® fauxchét® yarn tool.